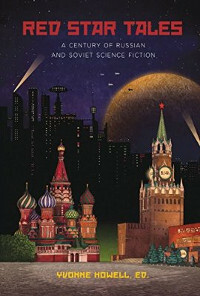 Red Star Tales began as a Kickstarter initiative to publish “the first comprehensive edition of truly notable Russian and Soviet science fiction – works chosen for their artistic and scientific merit, not because of any political or ideological agenda.” None of the 18 stories included in the collection has ever been translated into English until now, and because of this book we can truly appreciate the dramatic and dynamic scope of Russian science fiction from the end of the 19th century, through the Soviet era, and into modern times. As such a book should do, Red Star Tales includes a useful introduction to the development of the genre in relation to Russian political and social changes, as well as a section dedicated to information about each of the authors and the translators who have made them available to us English-language readers. Editor Yvonne Howell comments on each story in this introduction, providing much-needed context and background so that readers can more readily appreciate the extent of this unique volume. Especially appreciated by this reviewer is the book’s three-part structure, which helps us contextualize each story in terms of its genesis in a particular era of Russian/Soviet history (Part I: Red Star Rising [1892-1915]; Part II: Red Star in Retrograde [1926-1946]; Part III: Red Star Reforming [1958-1992]). So what were Russian sci-fi writers preoccupied with during the long twentieth century? Well, you know, EVERYTHING. We have robots and “teleportation” doors, adventures on the moon and reanimated heads, hyper-intelligent chimpanzees and human consciousness transformed into radio-wave signals. And that’s just the tip of the proverbial iceberg. Part I includes two tantalizing and unfinished pieces by Valery Bryusov (“Rebellion of the Machines: From the Chronicles of the Thirtieth Century,” 1908, and “Mutiny of the Machines: A Fantastic Tale,” 1915, both translated by Anindita Bannerjee), and I think you can guess this particular writer’s preoccupation. In the first story, Bryusov’s narrator chronicles how humans let their machines take over so much of their lives that soon the machines were in control. Without warning, some of these machines started using technology in people’s homes to attack them. The second piece details the rise of the machines in a slightly different way, but in a note, the author explains that Germany’s belief in the power of technology during the Great War invites speculation about the results of such faith. Included in Part II are stories about severed heads that are brought back to life by an unscrupulous scientist (“Professor Dowell’s Head” by Alexander Belyaev, 1926, translated by Muireann Maguire) and the Tunguska explosion (“Explosion: The Story of a Hypothesis” by Alexander Kazantsev, 1946, translated by Nora Seligman Favorov), both of which imagine alternate vivid realities in the fields of medical and nuclear research. We have two (count ’em, TWO) previously untranslated Strugatsky pieces, one of which is an excerpt (“The Spontaneous Reflex,” 1958 and Those Burdened by Evil, 1988, both translated by Kevin Reese) concerning a big, hulking, complex robot and a “Demiurge.” One of my particular favorites in this volume, included in Part III, is an excerpt from Doorinda (1990) by Daliya Truskinovskaya, in which a hard-working single mother who has been beaten down by life discovers that her apartment door can act as a magic portal. Truskinovskaya’s deft mixture of mystery and humor makes me want to read more of her work, and thus hope that more of her stories are/will be translated into English. If this has whetted your appetite for newly-translated 20th century Russian sci-fi, then by all means grab a copy of Red Star Tales. You’ll be glad you did.